Formerly known as Harbord, Freshwater is approximately 2 square kilometres in size. Bordered on the East by the Tasman Sea, south by Queenscliff and Manly Lagoon, West by Nolan Reserve and to the North by South Curl Curl. 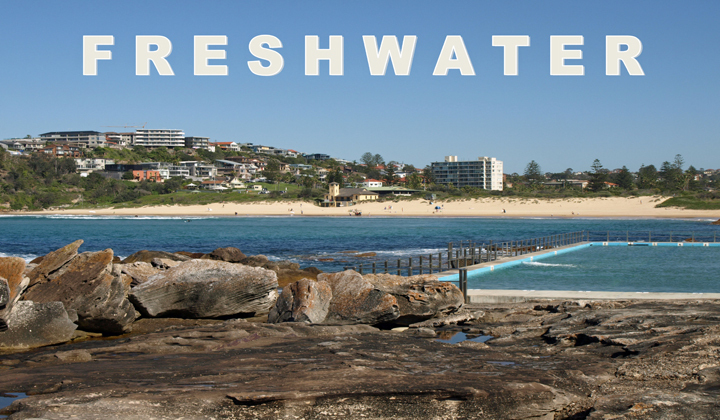 Freshwater has five parks covering nearly 9% of total area plus Freshwater Beach which is widely recognised as being one of the best local surf beaches as well as being one of the most family friendly beaches. Behind the beach is a large reserve area popular for family gatherings, BBQ’s. Pilu, Harbord Beach Hotel and the newly rebuilt Harbord Diggers Clubs are just some of the many quality eateries, cafes and bars located in the area. The people of Freshwater describe their suburb as a village which is the immediate impression one gets when visiting this area. The population of Freshwater in 2006 was 8,404 people. By 2011 the population was 8,252 showing a population decline of 1.8% in the area during that time. At the current time, there are a number of new developments under construction in Freshwater, which will see the population growing slightly in size; most notably the redevelopment of the Harbord Diggers site and two new developments n the Freshwater business district. The predominant age group in Freshwater is 25-34 years. Households in Freshwater are primarily couples with children and are likely to be repaying over $4,000 per month on mortgage repayments. The local Harbord Public School has recently been expanded to accommodate a growing school age population. In general, people in Freshwater work in a professional occupation. In 2011, 62.4% of dwellings in Freshwater are owner occupied. As at November 2017, the median sales price of a house in Freshwater reached a peak at that time of $2,630,000. For a unit the median price was $865,000, slightly down from the peak price in June 2017 of $882,000. The number of houses being sold in Freshwater in 2017 was significantly down from previous periods. No doubt this shortage of supply has contributed in part to the significant increase in house values in the area. Shane Spence has been the licensee in charge of Bower Real Estate Pty Ltd trading as Shane Spence Real Estate since May 1997. Shane is widely recognised as being a leading sales and auction specialist as well as managing a highly efficient property management portfolio on behalf of his clients. In the event you are thinking about buying, selling or leasing real estate in the Freshwater area, do not hesitate to contact Shane on 0412 226 722, or email shane@shanespencerealestate.com.au. Disclaimer: Whilst all reasonable effort is made to ensure the information in this publication is current, neither Bower Real Estate Pty Ltd or CoreLogic warrants the accuracy or completeness of the data and information contained herein and to the full extent not prohibited by law excludes all for any loss or damage arising in connection with the data and information contained in this publication.